Kolbe Conative Index testing allows for certified trainers to consult and assist their clients with a variety of issues. 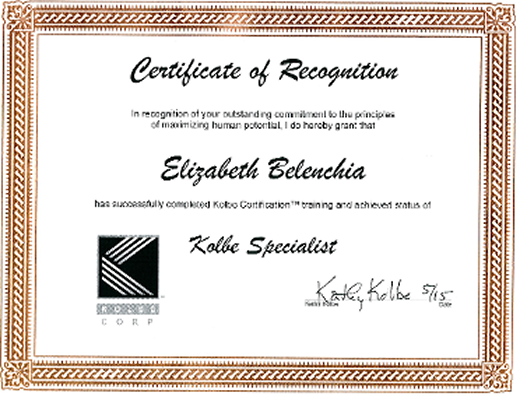 As a Kolbe Specialist, Elizabeth’s goal is to improve the current operating efficiencies of her clients' businesses by revealing the conative strengths of each employed business professional in Spartanburg, SC. Through consultations and training such as team building exercises, leadership and management training you will be presented with solutions and strategies for success. Such solutions have maximized businesses overall effectiveness, productivity and relationships both inside the office and out. 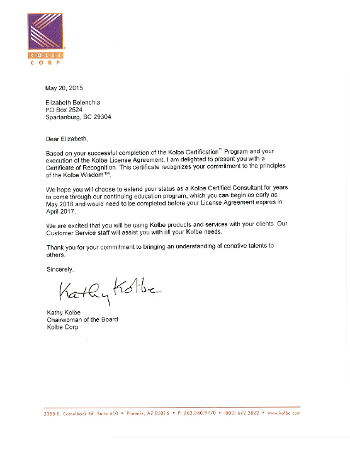 Elizabeth is currently the only Specialist for Advanced Certified Training with Kolbe Corp in the state of South Carolina.